Easter Theme Challenge - if you hadn't already guessed! Thanks to everyone who participated in the last challenge. Thanks to everyone who also voted in the poll! I really appreciate that and I will do my best to come up with challenges you all want! By the time you reach the end of this post you will notice that I have decided to try out InLinkz for adding links instead of Mr. Linky. I just think the image previews are so cool, so I wanted to try it out. We'll see how it goes for this challenge and then I'll make a final decision on that! Please remember if you use one of my digital stamps you get a second entry into in the challenge. Winner will receive THREE digis of their choice from my store! Alot of new digital stamps have been added recently, so make sure you check those out! Here is some fantastic INSPIRATION from the design team. Find links to their blogs in the sidebar! Please remember to use InLinkz and when adding a link, add the link to your project, not the link to your entire blog. Please click here if you've forgotten the rules. You have TWO WEEKS to submit an entry! If you're using a photo gallery instead of a blog please use this weeks tag: "PC26", blog users can just use the tag "Penny's Challenges #26"
You have two more days to enter the BIRTHDAY challenge before a new challenge is posted! There are also two days left to vote! So if you've already done that, Thank You! If not, get over here and vote if you want some say in future challenges! Thanks to each and every one of you who participated in our "Green" challenge. That was a lot of fun. Thanks to all who have voted as well. If you haven't already voted, please see the side-bar and have your say!!! This week we are again doing a birthday challenge. 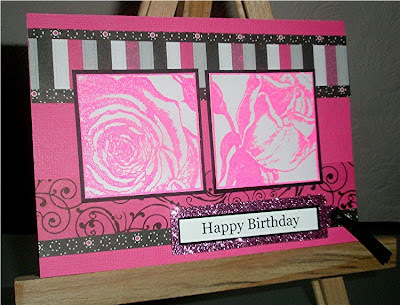 You cannot have a big enough birthday card stash and who doesn't want to scrap those birthday layouts!? I have birthday on the brain, my daughter's birthday is right around the corner, my sister and brother-in-law's birthday's are just days from that and my husband's birthday is coming too. Please remember to use Mr. Linky and when adding a link, add the link to your project, not the link to your entire blog. Please click here if you've forgotten the rules. You have until 6am next Wednesday, March 31 to submit an entry! If you're using a photo gallery instead of a blog please use this weeks tag: "PC25", blog users can just use the tag "Penny's Challenges #25"
Linda B. is our featured "Green" card for last week's challenge! Congratulations Linda! Please email me your choice of two free digis from Creations by Penny. Get 35% off your order of digital stamps. Just use coupon code 35digi at checkout!!! Visit http://www.creationsbypenny.com/store to make your purchase! question that's just been posted in the left sidebar!!!! GREEN FOR ST PATTY'S DAY! Please remember to use Mr. Linky and when adding a link, add the link to your project, not the link to your entire blog. Please click here if you've forgotten the rules. You have until 6am next Wednesday, March 17 to submit an entry! If you're using a photo gallery instead of a blog please use this weeks tag: "PC24", blog users can just use the tag "Penny's Challenges #24"
Hazel has won our last challenge! Congratulations Hazel! Very pretty card. Send an email to pennyandbryan [at] gmail [dot] com and let me know which 2 digi's you'd like from Creations by Penny.